Instances of Commediation recreates the multiplicity of environments we live in today, along with our spatial impermanence. 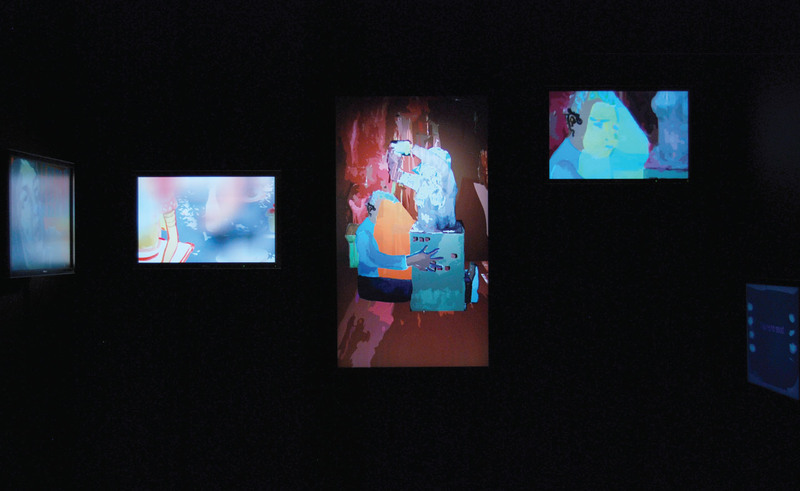 Five LCD screens show different perspectives of simultaneous fictional events that begin as watercolor paintings and later become animated. This process of remediation (Bolter and Grusin, 2000), and of the adjustment of an older medium to a new one, becomes an analogy to the adjustment of our traditional social behaviors to new spaces of social interaction. Rita Sá’s work involves creation of conceptually based micro-sociological animations and installations. She likes to depict social behaviors based on an understanding of “behavior” as an animal-like activity, an intrinsic quality that is present in our daily interactions but tends to be concealed as societies and civilizations grow. She usually plays with the conformity and performing aspects within the interactions that take place inside small social groups. This work is made possible in part with support from Fundação Oriente and Instituto Camões.